Men's Dual Finish Black Celtic Ring : LOVE2HAVE in the UK! 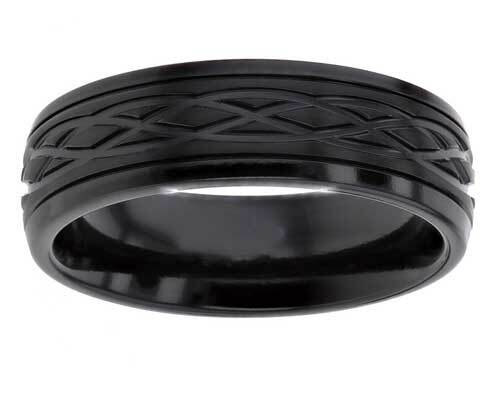 A 7mm wide, men's black zirconium ring with a black Celtic interlaced knot style engraved pattern. The engraving is a very contemporary styled version of the Celtic line of life that sits centrally. The ring is slightly domed in profile and divided by a central strip with two outer rails on either side. The central strip creates the dual look is a matte finish and the rails polished. The engraving methods we use on our titanium and zirconium Celtic rings are done using a computerised laser engraving machine. The geometric designs are perfectly engraved every time to an outstanding quality. We can produce simple designs and intricately interlaced designs also that look precisely like the Celts intended them.